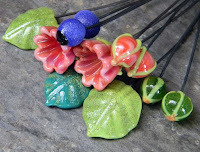 Just a reminder that acclaimed bead and lampwork artist Hannah Rosner is joining us at BeadFX for four amazing classes. You still have time to take advantage of the Early Bird Bonus registration but don't delay - the special offer ends Saturday, October 1. 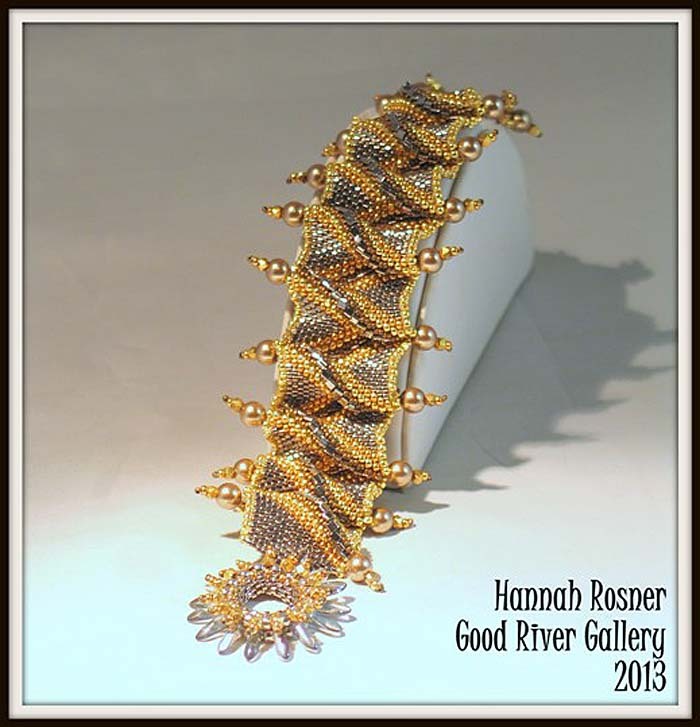 The class samples for each of Hannah's classes are in the store now and they are absolutely stunning. 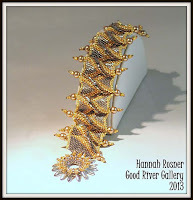 To really appreciate the pieces, you need to see them in person - the photos just don't do them justice! This has been my most popular class at Bead & Button! Make an undulating bracelet that just uses even count flat peyote stitch - but HOW does it ruffle? That's the trick! We'll also make a fun matching toggle clasp in class. Bonus: Take this class and receive a $20 Gift Certificate that can be used toward the purchase of your class supplies. Any remaining balance will be yours to use toward future purchases or classes. The $20 Gift Certificate is in lieu of the standard 15% Student Discount. Skill level: Intermediate; students need to be really comfortable with even count flat peyote. Class fee: $120 plus HST. Early Bird Bonus: Book this class by Saturday, October 1 and receive 10% off the class fee. The early bird discount is in addition to the $20 Gift Certificate. Class fee: $150 plus HST. Early Bird Bonus: Book this class by Saturday, October 1 and receive 10% off the class fee. The early bird discount is in addition to the $20 Gift Certificate. 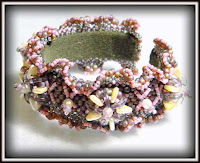 Use Czech Mates two-hole triangles and crescents over a firepolish base to make a fun bracelet with undulating ruffles. Loosely based off of embroidery techniques, but you don't have to really dig bead embroidery to do this one. We'll talk about versions over a bracelet form and soft cuffs. Bonus: Take this class and receive a $30 Gift Certificate that can be used toward the purchase of your class supplies. Any remaining balance will be yours to use toward future purchases or classes. The $30 Gift Certificate is in lieu of the standard 15% Student Discount. Skill level: Intermediate; students need to be really familiar with even count flat peyote stitch and comfortable with picot edging. Class Fee: $195 plus HST. Early Bird Bonus: Book this class by Saturday, October 1 and receive 10% off the class fee. The early bird discount is in addition to the $30 Gift Certificate. 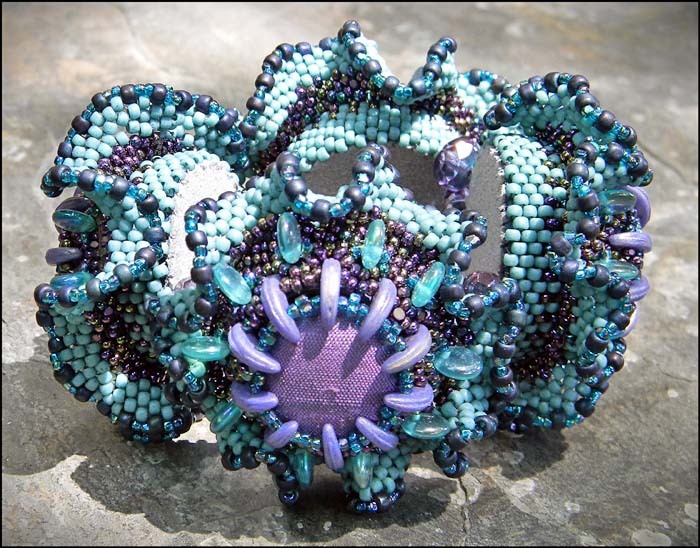 Take your peyote stitching skills to a new level by making this 3D statement bracelet with silk, ruffles and 2-hole crescent beads. We'll also discuss a new way of setting a stone or rivoli. Bonus: Take this class and receive a $30 Gift Certificate that can be used toward the purchase of your class supplies. Any remaining balance will be yours to use toward future purchases or classes. The $30 Gift Certificate is in lieu of the standard 15% Student Discount. Skill level: Intermediate; students must be comfortable with peyote stitch. 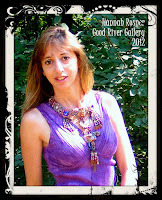 To see the complete information about each class, click on the class title (the class page will open in a new webpage) or go to www.beadfx.com and click on 'Classes'. Follow the links to the October class calendar. 25% off Workin' on the Chain, Gang! Dirty is, as dirty does! What's on my bead mat - September edition! What the heck is a dirty pour?